Mitch McConnell is demanding a vote today (Tuesday) on whether to begin debate on an as yet unknown healthcare bill - possibly the crappy House version, possibly the crappy Senate version - the whole thing is kinda crazy. Here's more from the Washington Post if you feel like reading. 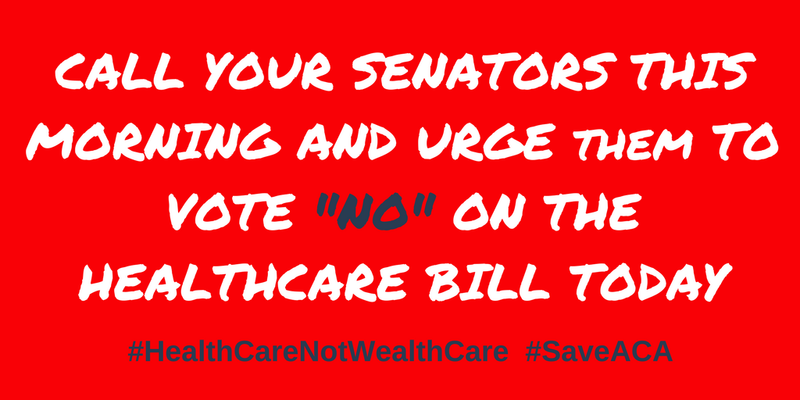 If you live in a state with one or more Republican Senators, get on the horn ASAP and urge them to vote "NO!" on this measure/bill/thingy/whatever it ends up being. 1. Find your Republican Senator's phone number here - keep in mind you will likely have to call more than one office to get through. 2. When you get through, say, "Hi, my name is ____ and I'm a constituent calling from _____to urge the Senator to vote NO on whatever healthcare bill is brought up today. I don't care if this is a procedural vote, I will consider any YES vote by the Senator a vote to take away healthcare from 24 million Americans (if you get your coverage through an Obamacare plan, mention that now). Thank you for taking the time to take my call." If you live in a state with Democratic Senators, your job this morning is to get in touch with your friends who have Republican Senators and get them to call 'em. Especially if your friends live in Alaska, West Virginia, Ohio, Nevada, Maine, Pennsylvania, Arkansas, and Arizona (Senator McCain has announced that he will return to DC today despite his brain cancer diagnosis) - all of which have Republican Senators who have "reservations" about the healthcare bill(s). Email your friends (feel free to forward this message to them), text them, send them a message on Facebook, call them - whatever you think will work best. Make sure to include the phone number look up and the script to make it easier for them to call.